Do U want the excellent bust support that only an underwire can provide, but are tired of the uncomfortable, wire poke that comes along for the ride? If so, Wonderful U™ is the solution U’ve been looking for. U see, a traditional shaper that incorporates conventional, underwire support encases its wires in a way that fixes their position on the bust. And, it uses a rigid center gore (that piece of fabric in between the cups) as an anchor so that the garment can provide its extra lift and support. But that combination of inflexible components can’t adjust to variations in body shape. It also can’t adjust to a body’s twists, turns, and bends. The result is that annoying wire poke in the ribs or underarm area that no woman wants to feel. But a garment made with the patented Wonderful U™ doesn’t cause these problems. Its flat wires are encased in fabric covers that allow the wires to float. 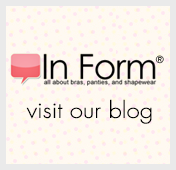 These are fastened to the flexible bra band and bottoms of the cups, and not to each other. It’s the bra band, not the center gore, that functions as the essential anchor allowing the Wonderful U™ to deliver its lift and support. Freed from its anchoring job, the center gore can be made from flexible fabric. It’s this combination of flat, floating wires and a flexible center gore that will let the Wonderful U™ adapt to your body’s unique shape. And, when U twist, bend, and turn, the wire will adjust to your movements so U won’t feel that uncomfortable poke in your ribs or under your arms. Not only will U experience excellent, natural-looking lift – with each cup’s apex elevated up to one full inch - U’ll experience these results while feeling like U’re completely wire-free. Wonderful U™ – The Ultimate Comfort Wire.